Silver Spring, Md. 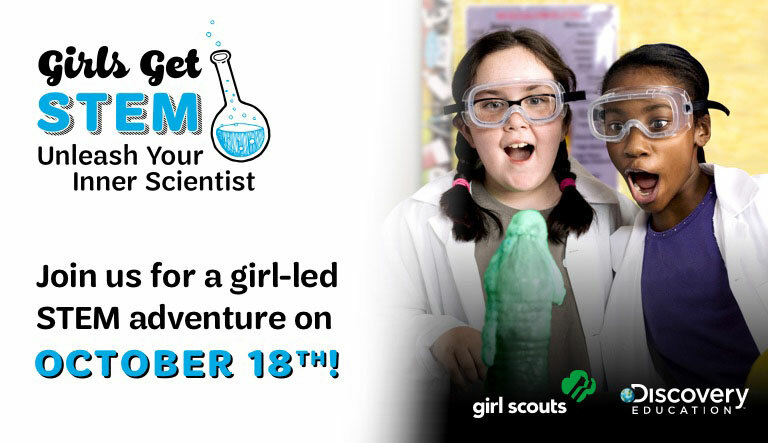 (Monday, October 15, 2018) – Girl Scouts of the USA (GSUSA), the preeminent leadership development organization for girls, and Discovery Education, the leading provider of digital content and professional development for K-12 classrooms, today announced Girls Get STEM: Unleash Your Inner Scientist – a national initiative to spark girls’ interest in STEM (science, technology, engineering and math). The program will provide educators, Girl Scout troop leaders, and families with standards-aligned curriculum aimed at addressing gender equity in STEM education through a series of girl-led, girl-tested and girl-approved resources for students in grades 2-5. Recent findings from the Girl Scout Research Institute’s Generation STEM: What Girls Say about Science, Technology, Engineering and Math show 92 percent of girls interested in STEM fields believe they are smart enough to have a career in STEM. However, women continue to be underrepresented in these fields. Girls Get STEM: Unleash Your Inner Scientist aims to change this trend by cultivating girls’ early interest in STEM and associated careers. Resources to expand STEM opportunities and create a more equitable future are available at no cost at GirlsLeadSTEM.com, they will also be available through Discovery Education Streaming. Additionally, these resources are available for use in and out of the classroom. For more information about Discovery Education’s digital content and professional development services, visit discoveryeducation.com. Stay connected with Discovery Education through social media on Facebook, Twitter, Instagram or Pinterest @DiscoveryEd. To join or volunteer for Girl Scouts, visit www.girlscouts.org. We’re 2.6 million strong – 1.8 million girls and 800,000 adults who believe in the power of every G.I.R.L. (Go-getter, Innovator, Risk-taker, Leader)™ to change the world. Our extraordinary journey began more than 100 years ago with the original G.I.R.L.™, Juliette Gordon “Daisy” Low. On March 12, 1912, in Savannah, Georgia, where she organized the very first Girl Scout troop. Every year since, we’ve honored Daisy’s vision and legacy, building girls of courage, confidence, and character who make the world a better place. We’re the preeminent leadership development organization for girls, and with programs from coast to coast and across the globe, Girl Scouts offers every girl a chance to practice a lifetime of leadership, adventure, and success. To volunteer, reconnect, donate, or join, visit www.girlscouts.org.